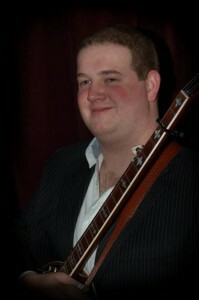 Chris is 29 years old and has been playing Banjo since autumn 2007. He progressed quickly from beginner to the standard you hear now and is constantly improving and expanding his playing ability. Chris is, as his surname suggests the son of Bassist and vocalist Mick Cooper. As such he has been immersed in the sound of Bluegrass music since the day he was born. When Chris was 6-7 years old, Mick bought him his first “real” Guitar and taught him the basics of Bluegrass music. Unsurprisingly Chris caught on quickly and played flat top Guitar until he reached his early teens. It was in his teenage years that Chris strayed from his roots in Bluegrass music and began to play electric Guitar. In this format Chris went on to play in several bands; covering many genres of music, from Rock and Blues to Punk, Funk and Heavy Metal. In autumn of 2007 wanting to try something completely new, Chris took a massive interest in playing Bluegrass Banjo. He began to learn under the guidance of a close family friend; Mr Alan Pearce. With Alan’s help Chris’s enthusiasm and musical talent accelerated his learning progress and he was soon turning heads with his excellent sense of timing and authentic sounding attack and tone. Chris was inducted into the Down County Boys line-up in January of 2009 and has continued to impress with his “hard driving”, Scruggs style Banjo playing and solid rhythm Guitar. The Down County Boys are proud to present another young and bright talent.